Welcome to a special episode of our Building Your Startup series sponsored by Mailgun. In this series, I'm guiding you through launching a startup from concept to reality using my Meeting Planner app as a real-life example. Every step along the way, we'll release the Meeting Planner code as open-source examples you can learn from. In today's episode, Mailgun stepped in to sponsor a tutorial about how I integrated its message routing and Store() API to handle replies from users. For example, when people receive meeting requests from others with Meeting Planner, they may just choose to reply and send a note like they would to a typical email thread. However, I wanted to automatically process the reply, add it as a note to the meeting, and then notify the recipient that an update is ready to view. Sounds complicated, but one of Meeting Planner's goals is to reduce the back and forth emails between people about planning and consolidate real-time changes into fewer notifications. If you're not yet familiar with Mailgun, it's the email automation engine trusted by over 10,000 website and application developers for sending, receiving and tracking emails. By taking advantage of Mailgun's powerful email APIs, developers can spend more time building awesome websites and less time fighting with email servers. Mailgun's API supports all of the most popular languages, including PHP, Ruby, Python, C#, and Java, and they offer excellent, well-organized documentation. It's been a go-to choice for me in many of my consulting activities, startups, and tutorials. 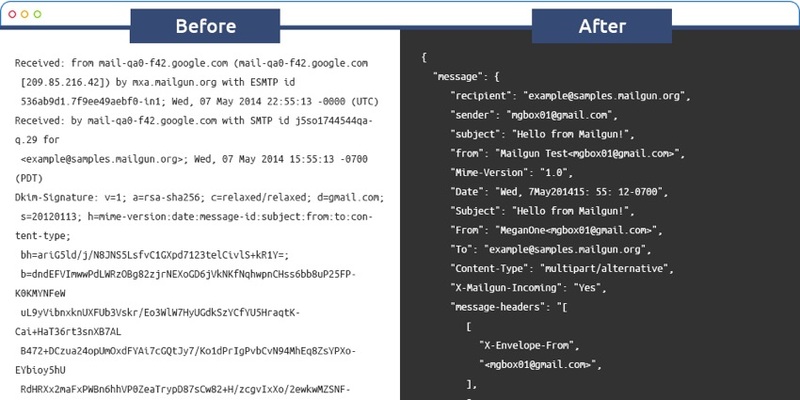 If you'd like to follow today's tutorial and aren't yet familiar with Mailgun, you may want to check out Exploring Mailgun: The Email Engine for Developers or How Geogram built a free group email service using Yii for PHP with MySQL. You may also want to read Store(): a temporary mailbox for all your incoming email for more technical background. All of the code for Meeting Planner is written in the Yii2 Framework for PHP. If you'd like to learn more about Yii2, check out our parallel series Programming With Yii2 at Envato Tuts+. If you haven't tried out Meeting Planner yet, try scheduling your first meeting now. It's really coming together and approaching alpha release. Feedback is welcome. If you have a question or topic suggestion, please post a comment below. You can also reach me on Twitter @reifman. And thank you, Mailgun, for sponsoring this episode of our startup series! Keep in mind that, because this is a sponsored tutorial, it may appear ahead of our regular Startup series episodes. So some code may appear further along than in upcoming episodes. I've already talked about using Mailgun's SMTP delivery for outbound emails in Meeting Planner, but what about responding to emails? However, I wanted to make it easy for people to respond to an email about a meeting and have their message easily added as a note to the meeting, and then group that update with other notifications of changes about the meeting. For example, a person might accept places and times from their invitation email but then also reply to the invitation directly from their email application or cloud-based email. The meeting organizer will receive one notification of updates rather than several. First, all the Meeting Planner scheduling emails will use a reply-to address to direct everything to a @meetingplanner.io mailbox. Mailgun's assigned to process all the inbound emails via our MX records. With Mailgun routing, we can ask the service to notify our server whenever new messages arrive. Then, in the background, we can process them. Mailgun parses messages with its expert algorithms so we don't have to. So it's easy for us to determine who replied to a message, which meeting they were replying to, and what note they were writing in their message. Finally, we'll add the note to the meeting and inform the other participant. Follow along as I walk you through how this is done. A while ago, I set up MX records for MeetingPlanner.io to funnel all incoming email directly to Mailgun. Using Mailgun's simple routing user interface, I set forwarding up for the jeff and support mailboxes for interested people to reach me or customer support. Once I was ready to integrate inbound routing for meeting scheduling, I decided to use Mailgun's store() API. 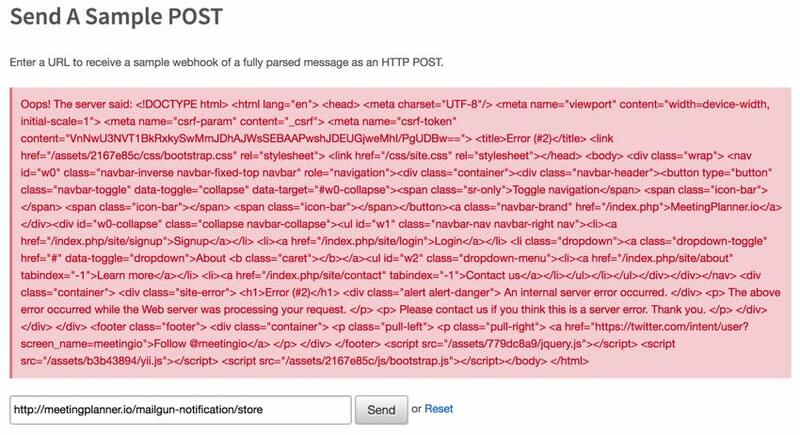 While Mailgun can deliver parsed emails to your web server in real time, temporary surges or your own service failures might cause you to miss messages. Based on customer feedback, Mailgun decided to build the capacity to store messages in its cloud and let your application process them over a three-day period. In some cases, the attachments are large and cause time-outs when we try to POST the data to their servers. In other cases, there is a large volume of inbound email and customers would rather just run a GET request at some interval instead of having to handle multiple POSTs from us. Finally, it serves as redundancy in case their web service goes down and they can't accept our POSTs. Whenever wildcard messages come into Meeting Planner, Mailgun will store() them and notify http://meetingplanner.io/mailgun-notification/store that there's a new message and then stop() processing. Expanding my API usage with Mailgun was again straightforward as their documentation is top notch. It provides support for a variety of languages, e.g. Ruby, Python, PHP, Java, C#, and Go. It offers working examples of implementing Mailgun functionality across its services—whether you're broadcasting, tracking, or routing. So, using Yii2 and its automated scaffolding code generator, Gii, I created migrations, models, and controllers for a MailgunNotification model. In this scenario, you have to write production code to process and later react to notifications and messages Mailgun notifies you about. Mailgun provides a helpful testing form to test out your server at the bottom of its routing configuration page. Because production servers are more difficult to debug, it took some time to get this right. So I did run into errors at first. 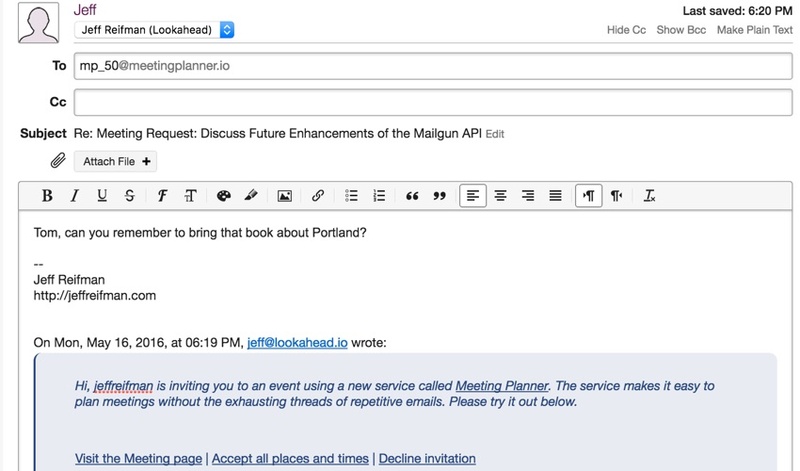 Next, I extended Meeting Planner's background processing to fetch new messages from Mailgun and process them. Parsing email with Mailgun is easy as they've done all the work that would otherwise take months (and months... and months... and months). Uninformed independent developers spend months coding email parsing on their own, a task that's never really complete. Mailgun manages this for you. I especially appreciate that Mailgun provides stripped-text, which takes out the sender's signature and the reply thread. I also use HtmlPurifier to prevent potentially harmful unescaped text from targeting our server. In a future episode, I'll explain how this event will trigger another event which helps Meeting Planner coordinate when it's best to notify meeting attendees that a new note or other change has occurred. Try sending a Meeting Planner invitation and ask your recipient to reply to the email with a message. You should receive a notification shortly after they've done so and then be able to view it on the event page. I hope you enjoyed this applied look at using Mailgun's routing and store() API. It's a pretty fun, sophisticated API to work with. Mailgun really offers a vast array of email services that are relevant to all kinds of coding and business development. And, impressively, they do a great job at all that they offer. Certainly this is a sponsored post, but as an experienced user, I offer my authentic recommendation for you to try out the service today. I've been using them for all of my projects. And, obviously, there are a lot of other scenarios we could build when processing messages. For example, we could let users respond with commands such as "late" and we'll know to text the other person that their colleague is running late. Please let us know which Mailgun features you'd like to see written about more in the future. You can post them in the comments below or reach me directly on Twitter @reifman.